Lord our God, friend of the lowly, who gave your servant, Saint Andre Bessette, a great devotion to Saint Joseph and a special commitment to the poor and afflicted, help us through his intercession to follow his example of prayer and love and so come to share with him in your glory. Through our Lord Jesus Christ, your Son, who lives and reigns with you in the unity of the Holy Spirit, one God, for ever and ever. St. André was born near Quebec, and entered the Congregation of the Holy Cross as a Brother. He performed humble tasks for over forty years and entrusted all of the poor and sick who flocked to his cell to the care of St. Joseph. During his life he was able to have a chapel built to the spouse of the Virgin Mary. After his death, the shrine grew into the great basilica known as St. Joseph's Oratory in Montreal. According to the 1962 Missal of St. John XXIII the Extraordinary Form of the Roman Rite, today is the feast of the Epiphany of Our Lord. According to the Canadian Conference of Catholic Bishops (CCCB) calendar, the Optional Memorial of St Andre Bessette is celebrated in Canada not on January 6 but on January 7. Brother André expressed a saint's faith by a lifelong devotion to Saint Joseph. Sickness and weakness dogged André from birth. He was the eighth of twelve children born to a French Canadian couple near Montreal. Adopted at twelve, when both parents had died, he became a farmhand. Various trades followed: shoemaker, baker, blacksmith-all failures. He was a factory worker in the United States during the boom times of the Civil War. At twenty-five, he applied for entrance into the Congregation of the Holy Cross. After a year's novitiate, he was not admitted because of his weak health. But with an extension and the urging of Bishop Bourget (see Marie-Rose Durocher, October 6), he was finally received. He was given the humble job of doorkeeper at Notre Dame College in Montreal, with additional duties as sacristan, laundry worker and messenger. "When I joined this community, the superiors showed me the door, and I remained forty years." In his little room near the door, he spent much of the night on his knees. On his windowsill, facing Mount Royal, was a small statue of Saint Joseph, to whom he had been devoted since childhood. When asked about it he said, "Some day, Saint Joseph is going to be honored in a very special way on Mount Royal!" When an epidemic broke out at a nearby college, André volunteered to nurse. Not one person died. The trickle of sick people to his door became a flood. His superiors were uneasy; diocesan authorities were suspicious; doctors called him a quack. "I do not cure," he said again and again. "Saint Joseph cures." In the end he needed four secretaries to handle the eighty thousand letters he received each year. For many years the Holy Cross authorities had tried to buy land on Mount Royal. Brother André and others climbed the steep hill and planted medals of Saint Joseph. Suddenly, the owners yielded. André collected two hundred dollars to build a small chapel and began receiving visitors there-smiling through long hours of listening, applying Saint Joseph's oil. Some were cured, some not. The pile of crutches, canes and braces grew. The chapel also grew. By 1931 there were gleaming walls, but money ran out. "Put a statue of Saint Joseph in the middle. If he wants a roof over his head, he'll get it." The magnificent Oratory on Mount Royal took fifty years to build. The sickly boy who could not hold a job died at ninety. He is buried at the Oratory and was beatified in 1982. On December 19, 2009, Pope Benedict XVI promulgated a decree recognizing a second miracle at Blessed André’s intercession and on October 17, 2010, Pope Benedict XVI formally declared sainthood for Blessed André. — Saint of the Day, Leonard Foley, O.F.M. Read more about the life of St. André. Learn more about the Holy Cross Brothers, the order of which Bl. André was a member. Pray for an increase in vocations and for those who are already living the religious life. If you live close to St. Joseph's Oratory of Mount Royal, make a pilgrimage. If that's not possible make a virtual pilgrimage. 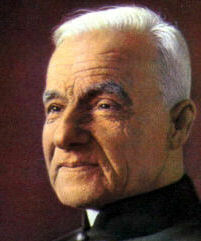 Say a prayer for the sick who were so dear to the heart of Brother André. Try the recipes offered to sample authentic French Canadian food.